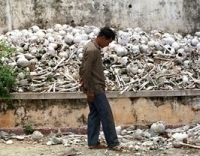 A photo of a ‘mountain of skulls’ from one of the Khmer Rouge’s ‘killing fields.’ Michael Savage argues that this could be a scene from Obama’s America. 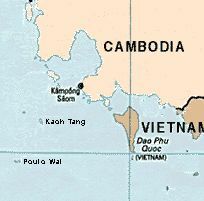 [Source: Mormon Soprano (.com)]Michael Savage, a conservative radio host, tells his listeners that President Obama is a “baby dictator” comparable to Cambodian dictator and mass murderer Pol Pot. Savage reminisces about “Communists” in San Francisco giving out copies of “the little red book,” presumably a reference to Chinese dictator Mao Zedong’s “Little Red Book,” that, Savage says, exhorted readers to kill anyone “with eyeglasses… members of the bourgeiosie… the entire middle class.” Savage tells his listeners that Pot used teenagers to carry out his orders, specifically targeting “teachers, doctors, lawyers, accountants, businessmen, businesswomen, you name it,” and others to either work in labor camps or for outright murder. “What does that have to do with Obama?” Savage asks rhetorically, and goes on to explain “why you should be very worried indeed.” Pot, a “mild-mannered college professor,” he says, “became radicalized” during his university studies in Paris, and brought an extremist Marxist ideology to Cambodia, which resulted, he says, in “a mountain of skulls.” Ideas, he says, “can be very, very powerful… ideas can also create horrors that are unimaginable to the average American. We can’t even imagine such a thing happening here, and we would say it can’t happen here. I would argue that it can happen here. And I would argue that only vigilance, only vigilance and resistance to this baby dictator and his band of terrorists can prevent this from occurring here. 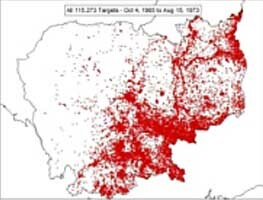 [Media Matters, 12/18/2009] According to a Yale University study, between 1975 and 1979, around 1.7 million Cambodians—a fifth of the nation’s population—died in what the study called “one of the worst human tragedies of the last century.… [T]he Khmer Rouge regime headed by Pol Pot combined extremist ideology with ethnic animosity and a diabolical disregard for human life to produce repression, misery, and murder on a massive scale.” In 2007, Pot, who died in 1998, was found to have committed “crimes against humanity, genocide, grave breaches of the Geneva Convention, homicide, torture, and religious persecution.” [Yale University, 2010] Savage has called the landmark civil rights decision Brown v. Board “sickening” (see May 18, 2004), accused Obama of being educated in a radical Islamic madrassa (see January 10, 2008 and April 3, 2008) and being a potential “radical Muslim” (see February 21, 2008), called Obama’s presidential victory “the first affirmative-action election in American history” (see February 1, 2008), accused Obama of being sympathetic towards the Nazis and the Imperial Japanese of World War II (see March 13, 2008), said that homeless Americans should be put in “work camps” (see June 6, 2008), called Obama an “Afro-Leninist” (see June 6, 2008), said that welfare recipients should lose the right to vote (see October 22, 2008), accused Obama of using his grandmother’s death to conceal his “efforts” to falsify his Hawaiian birth certificate (see November 10, 2008), accused Obama of planning to fire all the “competent white men” in government once he became president (see November 18, 2008), accused Obama of desiring his own “Hitler Youth” program (see September 2, 2009), and compared Obama to Chinese Communist dictator Mao Zedong (see December 3, 2009).